Serious marketers work from data. Yes, the best use their gut instincts for decisions, but it’s after they’ve digested reams of research on the target audience, product attributes, competition and dozens of other factors. The process can be as complex as a Swiss watch but the chances of success are rare—failure or stasis are the norms. The literature of marketing ranges far and wide—from allegorical, pep-rally sales guides to gossipy memoirs of advertisers. The best books, however, try to build on the foundations of knowledge and practice that were most comprehensively laid out by Northwestern University’s Philip Kotler in 1967. 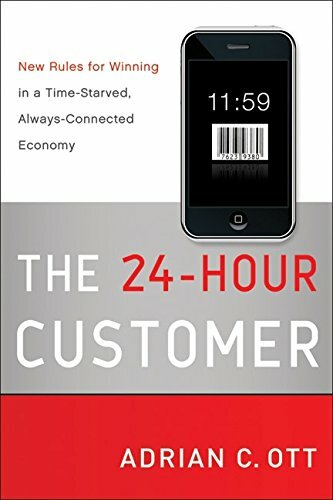 I think Kotler would appreciate Adrian C. Ott’s The 24-Hour Customer. At first, the reader might wonder whether he has been dropped into the gimcrackery in which many business books indulge. But Ott has a thesis worth considering in the web-wide world we increasingly inhabit—namely, that time is not just equal to money, it is worth more. Ott calls her theory “Time-oGraphics” (yes, I cringed as well when I first read it), taking its place alongside the demo- and psychographics that all professionals use when planning their market campaigns. Simply put, time shapes customer decision-making. A product or service that takes too much time to purchase or consume will be passed over. And one must consider not just a consumer’s time horizon but also her attention span in a multimedia, distraction-rich environment. Such a constraint actually presents many opportunities for companies to differentiate their offerings. Ott has a label for each, from “time slicing” to “time magnets” to “time shifting.” Even if you’re not crazy about such jargon, The 24-Hour Customer has loads more insight than a box full of the latest social-media marketing screeds. What Ott offers are not subtle tweaks to a business strategy. They fundamentally reshape a company’s approach. She is on to something that is difficult to undertake but potentially rewarding.